In the valley below the hilltown of Boonton, NJ lies a great wine store called Liquor Outlet Wine Cellars. Ok I admit I am waxing poetic, but tooling my Saturn Sky up the steep drive into Boonton I couldn't help but reminisce of rides into Panzano, a hilltown in Tuscany, in our Alfa Romeo. Boonton is a charming with many cafes and pubs. That's Panzano on the right. Boonton is below. Liquor Outlet Wine Cellars is away from Main Street in a warehouse and factory area on Myrtle Avenue, close to Interstate Route 287. It stood out as a bright oasis. For Mother's Day dinner Diana chose Marrakech in Montclair. 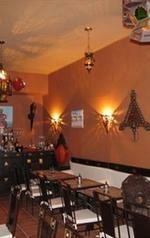 We love Moroccan cuisine having spent three weeks in that wonderful part of the world a few years ago. It is a beautiful country rich in culture and history. A French influence, which Morocco gained as a French Protectorate from 1912 into the 50's, makes Moroccan an interesting Middle Eastern dining experience. Toast, the cozy breakfast, lunch and brunch place that just opened in Montclair, is a gem. Located near the Montclair Art Museum, on Bloomfield Avenue, across the street from Whole Foods it is a great addition to the neighborhood.